FBA Franchise Broker and 2018 Rookie of the Year, Corey, was one of the first to sign up for our new co-broker program. This is a program where FBA generates leads, qualifies them and provides weekly sales support calls with participating FBA Franchise Brokers. In late October, Corey received a lead on a prospect in the Dallas, TX area that was looking to invest in a franchise. This prospect had been a top executive and had decided to pursue new opportunities after accepting a golden parachute payout from his employer. Although this prospect had an idea of what type of franchise he would like, Corey took him through the process to ensure they explored all options that could be a good fit for him to meet his personal and professional goals. After presenting several options, it was narrowed down to two. Nerds to Go and one another. The prospect attended Discovery Days for both franchise systems and was still torn on which direction to go. Corey worked hand-in-hand with his client to weigh the pros and cons of each, going back to his clients’ most important criteria being that it met the 4 Pillars for IKIGAI. IKIGAI’s 4 pillar philosophy includes: 1) doing something you love, 2) doing what you are good at, 3) doing what you can be paid for, and 4) doing what the world needs. The decision was then clear. Nerds to Go met all of these criteria. And the deal was signed in mid-February. Nerds to Go is one franchise owner stronger in Texas. Corey will claim he “got lucky” with his prospect because he was highly motivated, had an idea of a concept that he would be interested in, and was dedicated to doing his research to move through the process quickly to embark on his new career. With that said, Corey took the time to walk his client through the FBA’s proven process, exploring all options, and helping his client weigh the pros and cons of each. In the end, it was a perfect match all around. The FBAs co-broker program has provided a forum for franchise brokers to leverage the expertise of the FBA leadership team, senior franchise brokers and each other to help close more deals on good franchises. It’s a forum that allows for open communication on all deals that franchise brokers are actively working. Corey shared that this program has been “a huge help” in his early career as a franchise broker. Now that we’ve shared Corey’s success on closing a significant Nerds to Go deal, it’s time to share a bit about Nerds to Go. 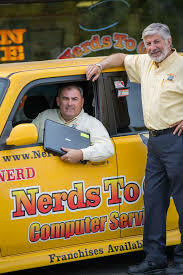 Nerds to Go has been named a number one source for computer service and solutions by small businesses and residential computer users throughout the United States. They pride themselves on Prompt Service. Quality Work. And Upfront Prices. Their Nerds are on call 24-hours a day, 7-days a week for emergency computer & technology diagnosis and repair. The Nerds to Go franchise development is being spearheaded by Dennis Mulgannon who has successfully launched the Flying Locksmith, Junk King, and Home Care Assistance into national brands. Their franchise model is adaptable as an owner-operator model (not working in the van), a transitional model from another career, or straight ROI model with a general manager in place running day-to-day.